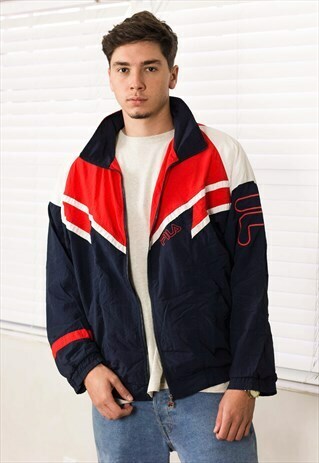 Retro Fila. Runs as an XL. Any inspected flaws, beyond normal vintage condition will be listed here: Loose cuffs and slight color-change. (pictured) Nice vintage condition. Model is 6 feet tall or 183 cm, and typically wears a size large. We ship every additional item for FREE with the original, so don't lose out on getting your look right with reduced shipping! If you don't love your item when it arrives, we have your back, so just let us know so we can make things right. We drop fresh one-off pieces daily, so follow us on Instagram (at) tagvin to see our drops first. TAGVIN - for the rare.